SIG SAUER SIG P320 Carry (P320C) Nitron Striker-Fired Compact Combat/Tactical Pistol and SIG P320 Full-Size (P320F) Nitron Pistol at the Range! : Shooting Impressions (Video!) | DefenseReview.com (DR): An online tactical technology and military defense technology magazine with particular focus on the latest and greatest tactical firearms news (tactical gun news), tactical gear news and tactical shooting news. All photo content and the top embedded video contained in this article was shot by DefenseReview.com, and is copyrighted. DefenseReview.com owns the copyright on all photo and top video content. All DR photos and videos were shot with a Sony Cyber-shot RX100 (DSC-RX100/B) Digital Camera with 20.2 MP (20.2-megapixel) still camera and 1080p HD video camera capability. The SIG MCX LVAW (Low-Visibility Assault Weapon) assault SBR/PDW (Short Barreled Rifle/Personal Defense Weapon) and SIG MPX SMG (Submachine Gun)/PDW weren’t the only new SIG SAUER weapons DefenseReview (DR) got to run at the SIG SAUER Academy range during the SIG SAUER New Media Writers’ Event last week. 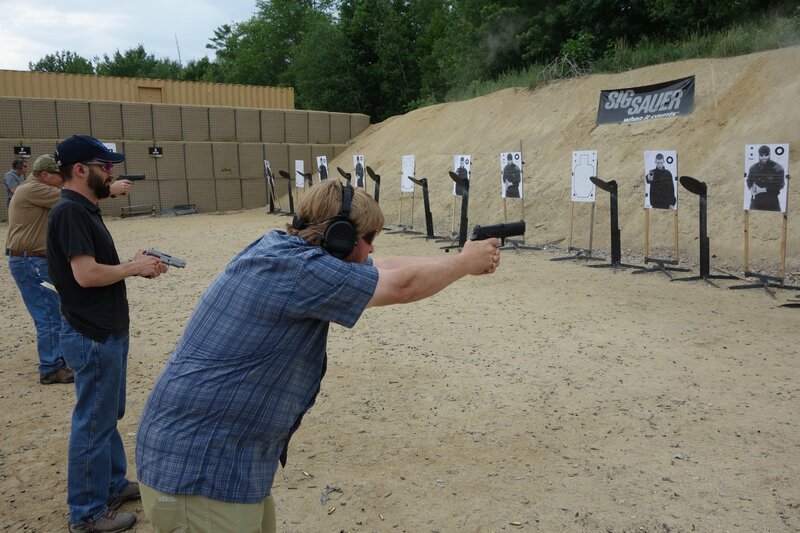 We got to run a bunch of other new guns, including 9mm Parabellum/9x19mm versions of the SIG P320 Full-Size (P320F) Nitron and SIG P20 Carry (P320C) Nitron striker-fired combat/tactical pistols, and were very pleased with the way they shot. We were especiallly enamored of the compact P320C, which is sized perfectly for concealed carry (CCW), using a quality IWB (Inside-the-Waistband) or OWB (Outside-the-Waistband) holster. While the SIG P320 Carry Nitron striker-fired compact combat/tactical pistol has higher bore axis than our current carry gun, the battle-proven Glock 19 (G19), this didn’t seem to hinder fast, accurate shooting or double-taps in the least at the relatively short distances we shot at, which you can see in the video below. The gun shot great. The SIG P320C was really a joy to shoot. It’s trigger pull and reset are both very good for a factory production gun. God only knows how good a gunsmith/pistolsmith can make it. 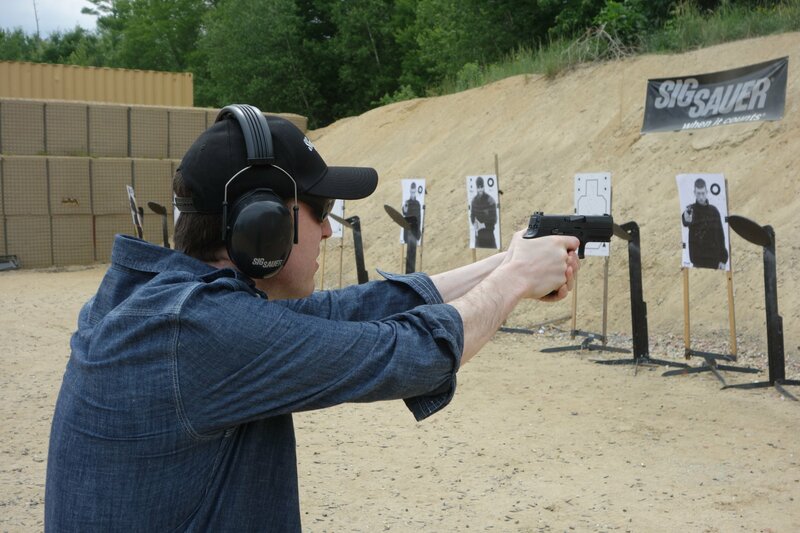 Anyway, the gun ran like a little champ with the factory trigger. Double-taps and triple-taps were a breeze, and there were no malfunctions, except you can see in the video that the P320C’s slide didn’t lock back after the last round, which might have been cause by our high thumb-over-thumb shooting grip, casuing our primary hand’s thumb to somehow hinder the slide stop. Update 7/05/14: One “Michael Polasek” just commented on our video clip below that someone called “Hickok45” experienced the same issue when he reviewed the P320, and he apparently traced it to a magazine (follower?) issue. So, we’ll try to find out if 1) that’s indeed the case, and 2) if so, if it’s been resolved in the latest production mags. One thing DR greatly prefers on the SIG P320 and SIG P320C pistols is the extended beavertail grip tang that allows the highest shooting grip possible and protects the web of the hand from slide bite. 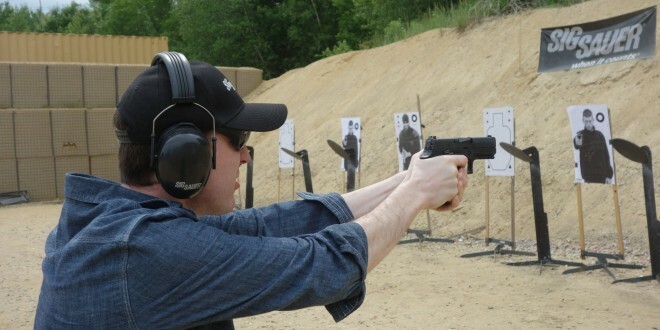 Your humble correspondent’s carry gun, the aforementioned Glock 19, unfortunately doesn’t have this feature, so its slide has been known to bite the inside of my shooting hand’s thumb knuckle during aggressive, fast shooting drills. 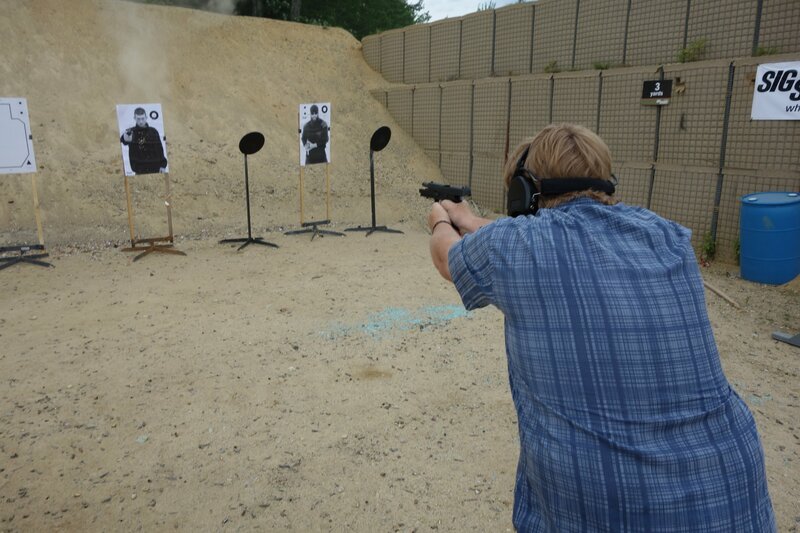 The only real problem I experienced with either pistol was on the last (and primary) range day during our (all-day) tactical shooting training at the SIG Sauer Academy. I ran an early version of the full-sized SIG P320 Full-Size Nitron pistol the whole time, and experienced some unpleasant trigger bite, which skinned the bottom of the web of my trigger finger, forcing me to put a bandaid on it (aww, poor me). When I informed the SIG SAUER Academy instructors about it, they told me the company was already aware of the problem, and that the trigger shape on was being modified to negate this problem for the production guns. Update 7/06/14: DR just watched Hickok45’s SIG P320 pistol review (see second/bottom embedded video below), and, sure enough, the trigger on his early-model P320 hurt his finger, too. AND, you can see the pistol’s slide fail to lock back after the last round at the 13:58 mark. Hickok45’s P320 video review is an entertaining watch, by the way, so check it out if you have the time. In the video, he disassembles the gun and shows the P320’s quick-removable modular chassis. The chassis contains the trigger group and is the serial-numbered part, thus making it the actual “gun” portion of the pistol. Other than that one issue (trigger bite), DR liked the gun, even though it was a little bit on the large and heavy side for us. The important thing is that the SIG P320F Nitron tactical pistol ran reliably all day, with zero malfunctions. We didn’t even witness any malfunctions with any other P320 pistols being run by other students in the course. Once we got the band-aid on our trigger finger, we were fine. If you’re looking for a new concealed carry pistol, Defense Review would recommend you take a serious look at the SIG P320 Carry Nitron compact CCW pistol. It’s a nice little gun with a really nice factory trigger. For those looking for a full-sized duty pistol, the SIG P320 Full-Size Nitron will make nice striker-fired alternative to the excellent, battle-proven SIG P226 hammer-fired pistol. The SIG P320 Carry Nitron is our (easy) favorite of the two, though, and gets the DR thumbs up, provided it proves to be reliable, accurate and durable under adverse environmental conditions (specifically dirt, mud, sand, snow, ice and water) and high round count. It would be fun to do a side-by-side shoot-off with the SIG Sauer P320C Nitron against the Glock 19, Smith & Wesson (S&W) M&P9 Compact, and the new HK VP9. Click here to read our first piece on the SIG P320 Full-Size Nitron and SIG P320 Carry Nitron pistols, which we published shortly after SHOT Show 2014. Previous: Happy 4th of July/Independence Day from DefenseReview.com (DR)!